European Reference Networks (ERNs) are inclusive, not exclusive, multi-professional, not single professional networks. This opening statement from the European Commission (EC) at the first EC ERN Conference (2015) remains true today as it did then. ERNs are not to be private ‘membership clubs’ of surgeons, of oncologists or geneticists, but externally facing communities of clinicians, researchers and patients that connect with your local hospital and with the wider world and share their wealth of knowledge, ultimately to improve the lives of the 30 million people living with a rare disease in the Europe. Rare diseases do not respect the borders that govern our everyday lives, be that social, trade or political borders, but indiscriminately affect a global community, one of 300 million people. Everyone fully recognises that no one country can stand alone to address the public health needs of rare diseases, due to the rarity of patients, experts and knowledge. The nearest expert can be in another country, on another continent or on the other side of the world. Our search to find someone who knows, someone who is an expert and can help give us an accurate diagnosis or alleviate our suffering, has no bounds and crosses any and all borders. The ERN legal framework (EC ERN Delegated Acts) establishes that Networks should collaborate closely with other centres of expertise and networks at national and international level; to comply with this mandate, Networks are to exchange clinical information, knowledge and best practice within and outside the Networks. The Networks have yet to celebrate their second birthday and are in their infancy; energy, time and resources have been focused internally on establishing relationships, common processes and infrastructure that can turn the blueprint of the ERNs into functional networks. Gradually, the Networks will move to full service provision and meet all the criteria and functions set out in the legislation, focusing externally on connecting experts and sharing knowledge beyond the European Union. But what of Brexit, a seismic political force that threatens our identities, our relationships and that will re-draw the European Union borders. Political winds are dividing us, our communities and our lives. In my opinion, everything about Brexit is a complete contradiction to the values of the rare disease community. Standing independent and alone to address the challenges that we face, is the place we have stepped from, to form and act together as one, to be recognised not as a lone voice, lost in our healthcare system where sometimes access to expertise or treatment are not available, but to act with one voice that has galvanized national, European and international action. As a community, we cannot afford to be divided by a political desire for independence. We cannot afford to take a backward step and lose the opportunity to draw on our collective voice, our collective experiences and knowledge and delivery on our mission to share, care and cure under the ERNs. We need the continued free movement of expertise and knowledge and not allow for the collective intellectual might of the Networks be diminished, as this will significantly impede the success and impact of ERNs for all patients in the EU. 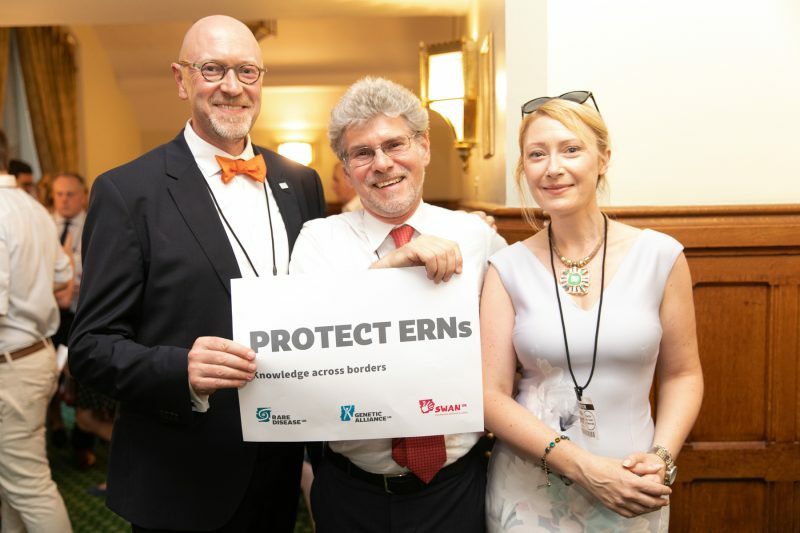 The European legislation requires ERNs to collaborate with international partners from third countries and, at a minimum, the centres in the UK should be treated like the centres from any other third country. The legal coverage to ensure the sustained involvement of UK hospitals and experts already exists. Should name badges of the UK centres be change from ‘full member’ to ‘international partner’, the continued longstanding collaboration of the experts under each of the ERNs, does not have to change and should not be interrupted. The networks are founded on the voluntary cooperation of clinicians and patients, so while the negotiation and later implementation of the new rules that will govern the relationships between the UK and EU27 takes place, the continued and sustained involvement of the UK experts is perfectly possible under the existing legislative framework for ERNs. All that is needed is a little political will.